I guess the time has finally come.. Ombre move over, cause there's a new girl in town and her name is Sombre! But no need to panic just yet, you're 15 minutes of fame might be up but you're passing the torch to a worthy successor. Sombre hair basically means Subtle Ombre Hair, which is a more natural and subtle ombre effect. While the ombre trend included very contrasting tones, from black roots to blonde ends, the sombre style makes it blend better. 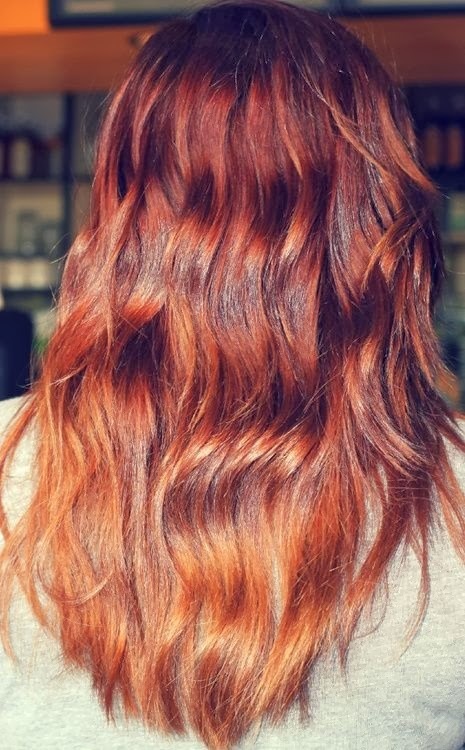 In my opinion it's simply the right kind of ombre! This technique looks so much prettier and polished. Some, bad, ombres made it look like you hadn't washed your hair in days and your roots had become so dark cause of all the grease... Or the brassy orange, sometimes even patchy, tresses aren't a good look either. Anyway, let's take a look at some examples of the new Sombre trend! Swedish fashion blogger Kenza is always seen with gorgeous sombre hair. Lots of thin highlights on the ends of your hair brighten up your look. A beautiful subtle red transition. The former reality TV-star has been seen with lots of variations of the ombre effect. Here she shows off the sombre look with dirty blonde roots and light blonde ends. What do you think of the sombre hairstyle? Do you like this natural look or do you prefer more drastic color tones? Or maybe you are totally over two toned hair?